Flexible systems allowing both square wave and exponential decay wave electroporation in a single unit. Ideal for all of your electroporation needs, including CRISPR, in vivo, in vitro, in ovo and more. The Gemini Twin Wave Electroporators are flexible systems allowing both square wave and exponential decay wave electroporation in a single unit. Ideal for all of your electroporation needs, including CRISPR, in vivo, in vitro, in ovo and more. Systems for cuvettes or plates. These waveform combinations enable researchers to easily and efficiently electroporate eukaryotic and prokaryotic cells in cuvettes or plates with one easy-to-use setup. Prokaryotic cells typically respond well to exponential decay wave pulses and eukaryotic cells are transfected most efficiently with square wave pulses. Combining these two waveforms gives researchers total flexibility to achieve the highest efficiency for their applications. Square wave and exponential decay waves power in a single unit. The Gemini SC system is designed specifically for cuvette-based in vitro transfections of eukaryotic or prokaryotic cells in suspension. With a wide range of pulsing parameters, advanced safety features as well as dozens of preset protocols, the Gemini SC is ideal for any lab requiring efficient cell transfection or transformation without the use of costly reagents. The Gemini X2 system provides the ultimate experimental flexibility. This one easy setup allows for transfections in cuvettes or high throughput plates, or the capability to utilize the wide variety of BTX specialty electrodes for specific applications. 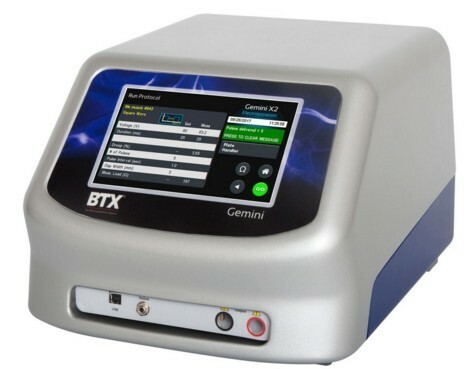 In addition, Gemini X2 electrical output specifications are wide-ranging, making it the most versatile electroporation system available today. Electroporation of suspension cells can be achieved in cuvettes (X2) or 96-well plates (X2 HT) with an HT plate handler. 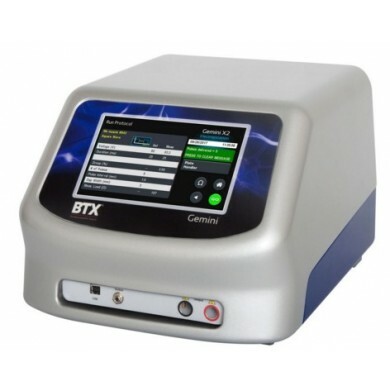 Additionally, the Gemini X2 can be paired with BTX specialty electrodes to deliver gene and drugs in vivo, in utero, in ovo and to explant tissues as well as adherent cells. Allows researchers to select which type of waveform they would like to use to transfect eukaryotic cells or transform prokaryotic cells. Typically, eukaryotic cells respond best to square wave pulses while prokaryotic cell respond well to exponential decay wave pulses. Combining these two waveforms gives researchers total flexibility to achieve the highest efficiency for their application. Permits intuitive touch screen or computer-controlled protocol programing and execution as well as password protection of protocols.Each system is programmable and offers unlimited protocol storage as well as dozens of proven pre-set protocols to reduce optimization time. The X2 systems provide protocol delivery log storage. Logs can be accessed for quality control, optimization or troubleshooting purposes.